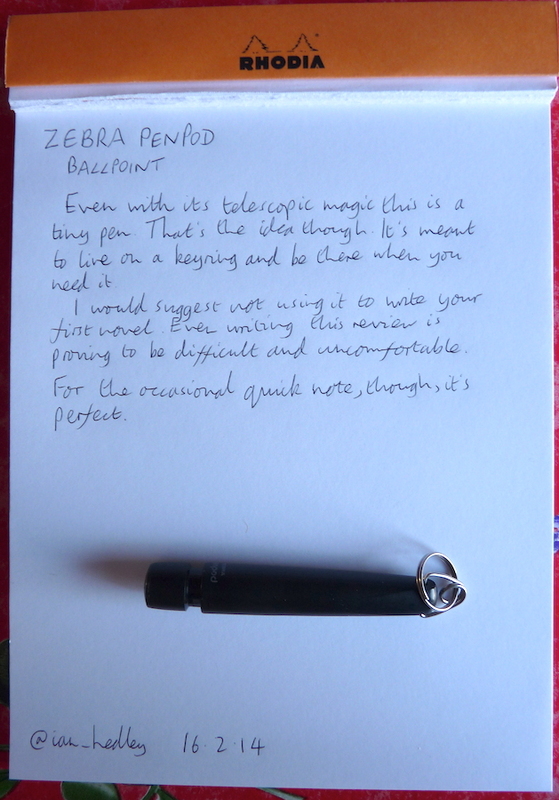 Zebra PenPod ballpoint pen review – Pens! Paper! Pencils! I don’t tend to review ballpoint pens here because I don’t like them very much. As such, I feel it’s better to leave their reviews to people who can appreciate them more. I wanted to review the Zebra PenPod though because it is a groovy little pen. I received this as a freebie, as part of a bigger order, from Cult Pens. It’s got not-very-subtle Cult Pens branding along the side but it’s also available au naturel. It takes D1 refills so a large variety of ballpoint refills will fit as well as gel refills such as the Pilot Hi-Tec-C. I’m reviewing it with the 0.7mm ballpoint refill it arrived with. As such, it’s fine. It leaves a mark on the page and so fulfils its purpose. If this was going to be a pen I used frequently I’d put a Hi-Tec-C refill in it. That’s not the its reason-d-être though. (See how Français je suis aujourd’hui.) It’s, frankly, jolly uncomfortable to write with – fit for nothing but a quick note here or there. And that’s what it’s for. 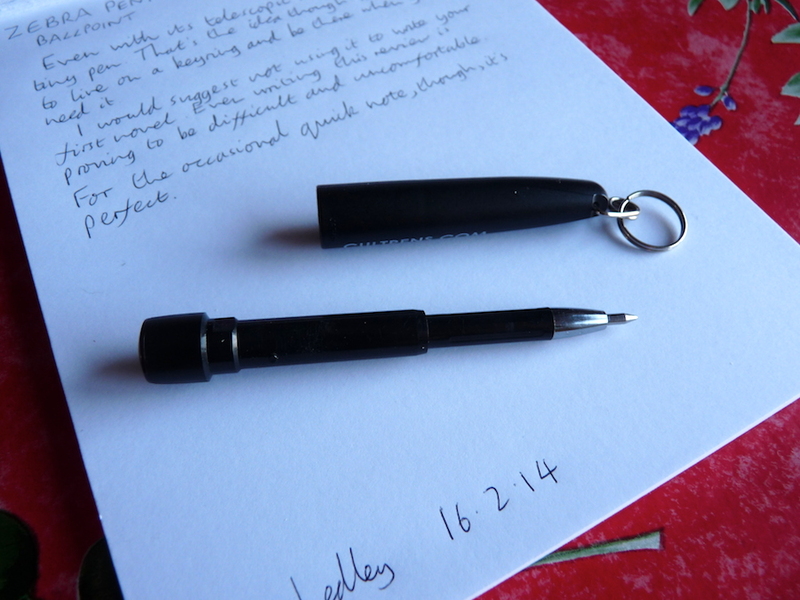 Thanks to a groovy twist and lock telescopic mechanism it’s a very small pen designed to hang from a keyring. 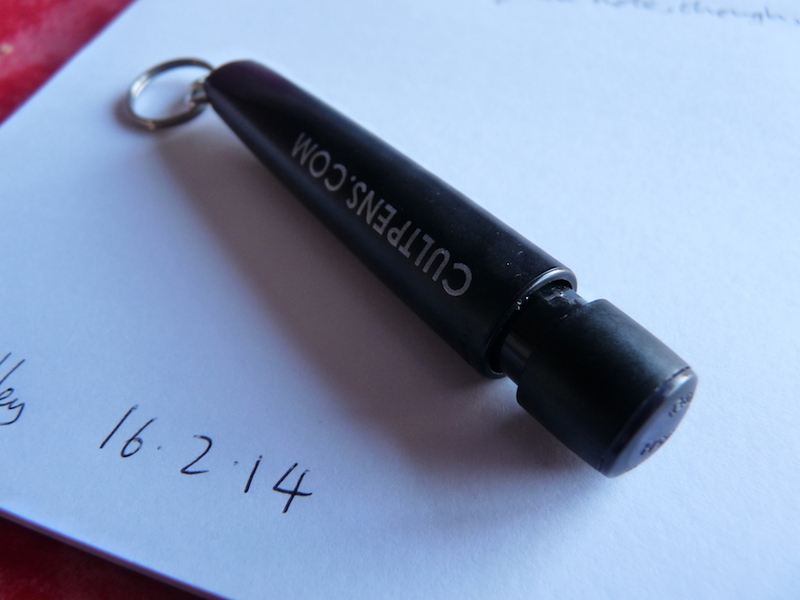 This is, in fact, the best (and only, to be honest) telescopic keyring pen I own. Here is a little video of how the pen opens and closes. I have to agree with MG in the comments. I lost the pen from the cap because it just fell out. I did find it again. Then it fell out again. I found it again. I learned my lesson. It’s a good idea that doesn’t quite deliver. I got one of these too in a large order. 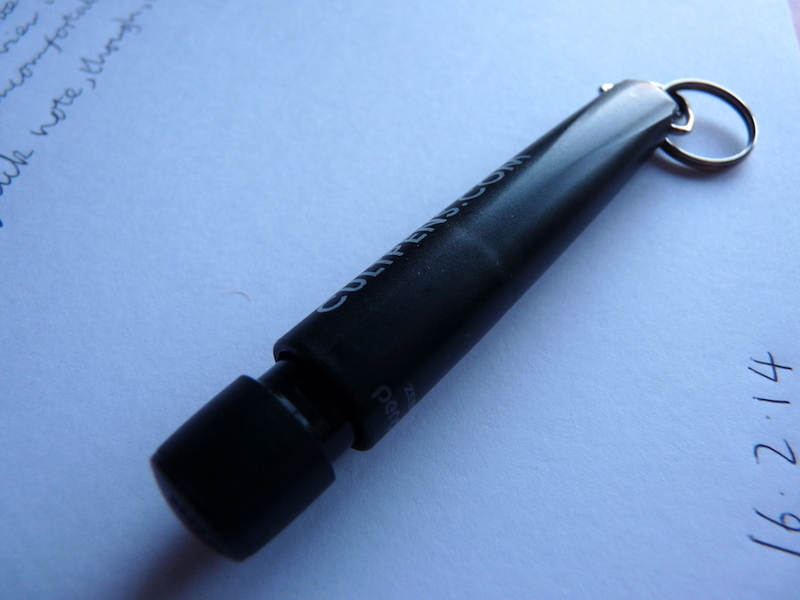 I thought was great idea for quick notes and thing…untill, of course, when the pen pops out the cap and it is lost forever! It did leave me with a plastic tube with Cult Pens written on and whilst I’m a big supporter of theirs, I couldn’t bring myself to keep it there. Opted for Cult Pens mini fountain pen as something more substantial in the pocket! Oh no! I haven’t had that happen to me…yet! I suppose it only needs to happen once and that’s that. What a shame. I would like to buy these. Anyone know where they are available?